Ada pertanyaan untuk Spiliotica on the Cliff Hotel? Dirancang untuk wisata bisnis dan plesiran, Spiliotica on the Cliff Hotel terletak strategis di Imerovigli, salah satu daerah lokal paling terkenal. Hotel ini tidak terlalu jauh dari pusat kota, hanya dari sini dan umumnya hanya membutuhkan waktu menit untuk mencapai bandara. Dengan adanya obyek wisata utama kota ini seperti Aegean Designs, Megaron Gyzi Museum, Museum Arkeologi yang sangat dekat, pengunjung akan sangat menyukai lokasi hotel ini. Spiliotica on the Cliff Hotel menawarkan pelayanan sempurna dan segala fasilitas penting untuk memanjakan para wisatawan. Hotel ini menawarkan sejumlah fasilitas di tempat untuk memuaskan segala jenis tamu. Masuki salah satu dari 24 kamar yang menggoda ini dan lepaskan rasa penat Anda dengan sejumlah fasilitas yang tersedia seperti kamar bebas asap rokok, AC, layanan bangun pagi, balkon/teras, telepon. Hotel ini menawarkan fasilitas fantastis, termasuk kolam renang luar ruangan, untuk membantu Anda bersantai setelah sepanjang hari beraktivitas di kota. Nikmati pelayanan tidak terbandingkan dan penginapan yang sungguh bergengsi di Spiliotica on the Cliff Hotel. You will certainly need to take more than a couple of steps into and out of the hotel. Strategically located on the cliff, the hotel offers a great view and very friendly staff and a great breakfast. Definitely requires a bit of stamina t climb yourself out to the nearby Fira (walking distance about 45 mins) and Oia. The bus that takes you to Oia is a 5 mins outside, or you can rent a motor car or ATV just right outside as well. Location and view of caldera is very good. But the rooms are very basic. Expected a bit more for the price. Staff are friendly. Fantastic view! Nice people! Clean and beautiful room! Great location! 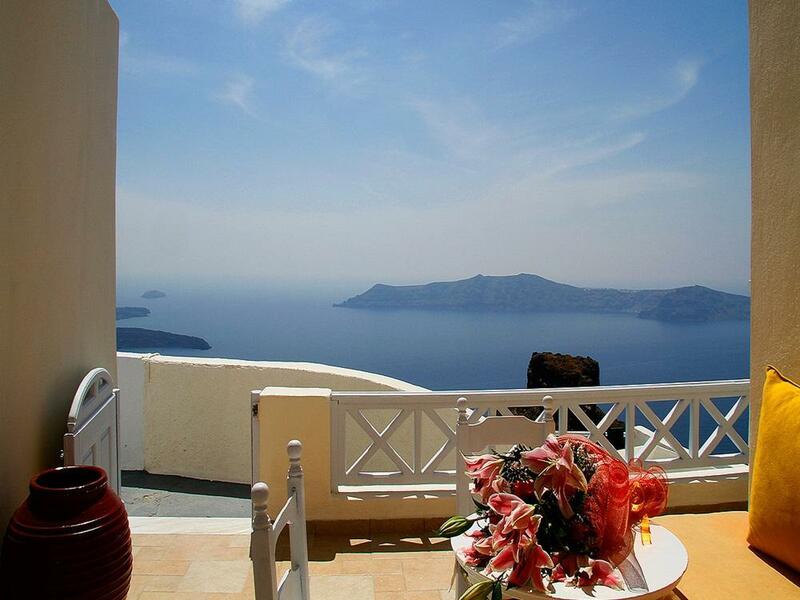 The view from my room was amazing, I have the whole magnificent view of the Aegean sea, Caldera, and can even see Oia from my room. I got the cheapest room but it's worth the price. Room was clean, there's a long couch against the window where I could lie down and look through to the spectacular view. It was perfect. Everyday there was relaxing and enjoyable. Breakfast was sufficient. Staff were all friendly. One of the guy carried my luggage the whole way down all the stairs from the top of the slope! The owner of the hotel was very helpful, informative and friendly. Wifi was free and good speed for skype calls. Hotel was only a short walk from the bus station which takes you to Fira or Oia, few restaurants around which are quite nice too. Overall, the view here is magnificent, I will definately come back and stay again. Great view, peaceful & good location. 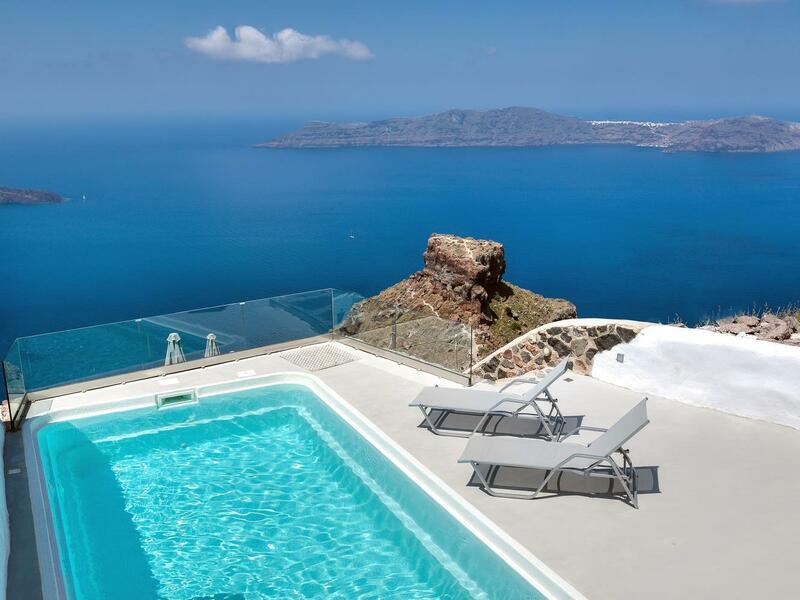 The view was exactly as shown in the photogrpahs shown during booking. Hence we were very satisfied. But apart from the great view, & value for money, there weren't any other good things about this hotel. The rooms were very small, the bed was also small and the bathtub was tiny. Since we were on our honeymoon, we wanted great views but we also planned to spend a lot of time in our room & this hotel wasn't what we had in mind. The place was almost suffocating. Also, there is no private balcony. The balcony is shared by 3 rooms. The curtains are quite short so people passing by can peep inside. The breakfast was ok. There was no variety. We stayed in Spiliotica for 6 nights and the breakfast was exactly the same every morning. The swimming pool is the size of a bathtub and it is situated in the breakfast area, just below the reception. Not a very nice thing to swim while people are eating. Also, there is no view from the pool as it gets blocked by the tables & chairs. Good thing about this hotel was that there was a bus-stop just 5 mins from the hotel and a mini-market just outside. Basically, if all you care about is the view, this place rocks it in that department. Absolutely gorgeous view of the Volcano island, the caldera and the blue sea. It was by far the hotel with the best views throughout our Europe trip. Good for just lounging around with a cup of ice tea! Views of cliff and ocean just outside the window plus beautiful sunsets to rival Oia's. 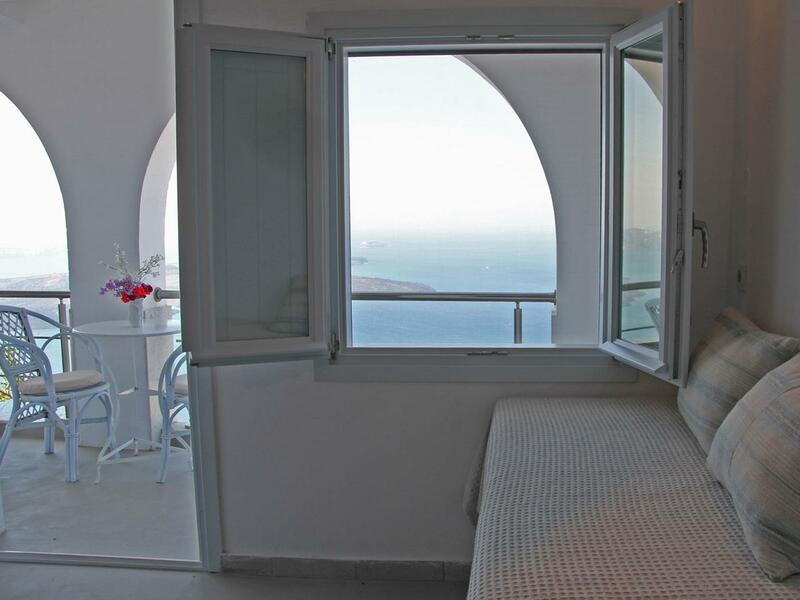 Another other point of view, enjoy the sunset of santorini right at your balcony. Staff are helpful, nice and informative. We are very satisfied and truly enjoyed our stay in Spiliotica. The view is exceptionally breathtaking. The room is very clean. Staff was very friendly and helpful. We also found out that sunset from hotel restaurant is as beautiful as sunset in Oia. We had an amazing time there. The view from the room is breathtaking,very clean rooms,bus stop 1min from the hotel.We relaxed in sunbeds enjoying the view and sun. We were also pleased with the service and quality of hotel bar and had amazing dinner in hotel's restaurant.Staff was exceptionally friendly and even offered to take us to the port!! From my search hotels around Spiliotica were overpriced. 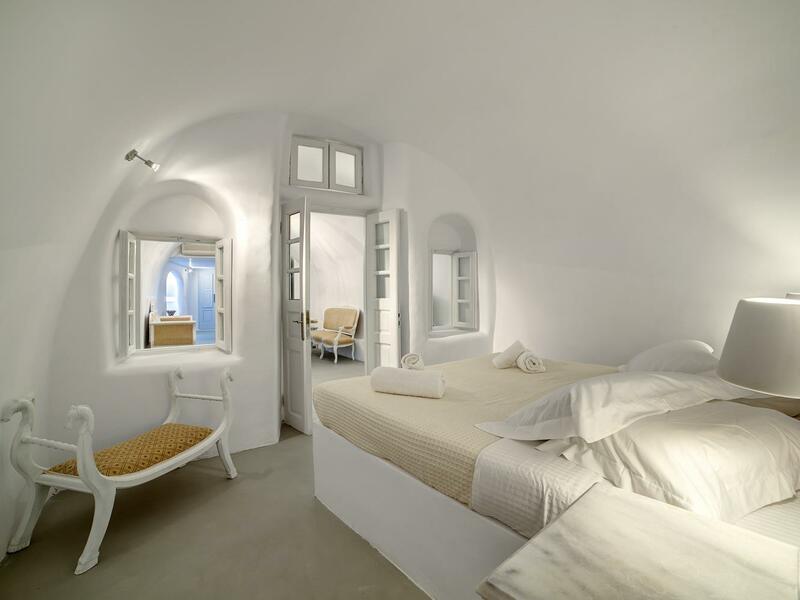 You don't need to pay more as this hotel is overall the best choice in terms of quality,service and price. 테라스에서 바라보는 노을은 최고!!! 친절한 직원!!! 조용한 장소!!! A notre arrivée, l'hôtel nous a semblé déjà un peu vieillot. Quand nous avons réceptionné notre chambre, nous avons été d'abord époustouflés par la vue. La chambre nous a semblé charmante sur le coup mais en regardant de plus près elle était vieillotte. La peinture a été faite à la va-vite et les finitions étaient inexistantes. 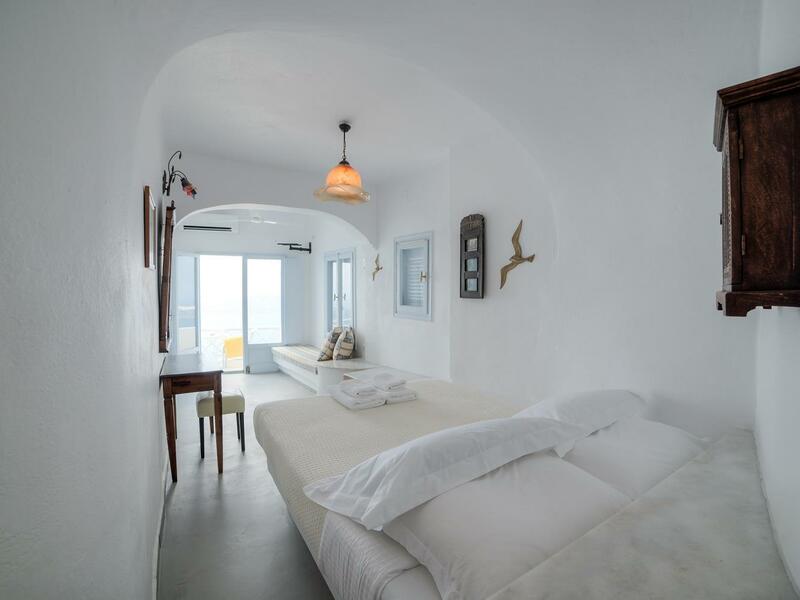 Cette chambre standard avec vue ne ressemblait pas du tout aux photos des sites internet (Agoda ou celui de l'hôtel) qui montrent une jolie chambre fleurie et une salle de bains récente avec une cabine de douche dotée de jets. Nous avons eu une chambre avec des murs cloqués par l'humidité, des prises électriques sans protection juste au-dessus d'un oreiller, une armoire de rangement vétuste et sale, une salle de bains avec de vieux carrelages bleus, une baignoire avec un rideau de douche en plastique basic et un plafond avec de la moisissure dans les angles, un vieux lavabo, une lunette fixée de travers sur la cuvette des wc et des bouts de tuyaux recouverts de scotch noirs, qui sortaient du sol à côté de la baignoire. Le lit par contre était assez confortable et la chambre était malgré tout tenue propre par le personnel de ménage. Aussi, notre chambre était la première de 3 chambres en enfilade sur le même balcon. Donc les voisins passaient devant notre porte pour aller dans leur chambre. Chambre fermée, on entendait tout. Même leur sèche-cheveux ! Un chemin assez fréquenté passait aussi juste en-dessous du balcon. Nous étions très déçus. Nous y avons dormi 5 nuits. Même si le patron et le personnel étaient fort sympathique et serviable, la vue magnifique, et les terrasses côté piscine très agréables, nous n'y retournerons pas car c'est beaucoup trop cher pour les prestations. Les photos sont mensongères. Nous voyageons beaucoup et c'est la première fois qu'il y a temps de différence entre les photos et la réalité.